So you have your new WordPress site, now what? Let’s get started by going over how to login. Ok, so the first thing you need to know about logging into your WordPress site is how to find the sign in page. Bookmark this page so that you don’t have to type it in every time. 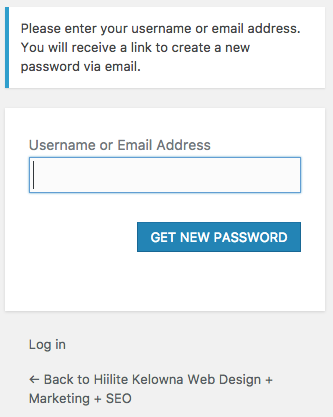 Now that you’ve reached the login page, just enter in your username or email and your password, and click LOG IN. Use a password management service such as 1Password or LastPass to keep all your login information safe and organized. If you have forgotten your password, you can reset it by clicking on the Lost You Password? link, just under the login box. Then enter in your username or the email on your account, and an email with a password reset link will be sent to you. If you don’t remember your username and you have forgotten what email you used for your account (or you no longer have access to that email), you will need to contact your site administrator. They can retrieve or update this information for you, allowing you to login.